Angelina Jolie (born Angelina Jolie Voight, June 4, 1975) is an American actress, filmmaker, and humanitarian. She has received an Academy Award, two Screen Actors Guild Awards, and three Golden Globe Awards, and has been cited as Hollywood's highest-paid actress. 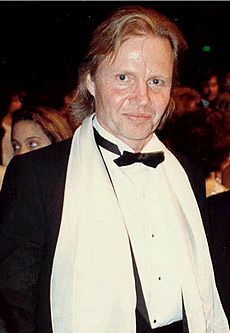 Jolie made her screen debut as a child alongside her father, Jon Voight, in Lookin' to Get Out (1982). Her film career began a decade later with the low-budget production Cyborg 2 (1993), followed by her first leading role in a major film, Hackers (1995). Jolie's starring role as the video game heroine Lara Croft in Lara Croft: Tomb Raider (2001) established her as a leading Hollywood actress. Her biggest commercial success came with the fantasy picture Maleficent (2014). In the 2010s, Jolie expanded her career into directing, screenwriting, and producing. As a public figure, Jolie has been cited as one of the most influential and powerful people in the American entertainment industry. For a number of years, she was cited as the world's most beautiful woman by various media outlets, and her personal life is the subject of wide publicity. Divorced from actors Jonny Lee Miller and Billy Bob Thornton, she separated from her third husband, actor Brad Pitt, in September 2016. They have six children together, three of whom were adopted internationally. Born in Los Angeles, California, Jolie is the daughter of actors Jon Voight and Marcheline Bertrand. She is the sister of actor James Haven, and the niece of singer-songwriter Chip Taylor and geologist and volcanologist Barry Voight. Her godparents are actors Jacqueline Bisset and Maximilian Schell. After her parents' separation in 1976, Jolie and her brother lived with their mother, When Jolie was six years old the family to Palisades, New York; they returned to Los Angeles five years later. Jolie then decided she wanted to act and enrolled at the Lee Strasberg Theatre Institute, where she trained for two years and appeared in several stage productions. Jolie first attended Beverly Hills High School, she then transferred to Moreno High School, an alternative school. She dropped out of her acting classes and aspired to become a funeral director, taking at-home courses to study embalming. At age 16 Jolie graduated from high school and rented her own apartment, before returning to theater studies. Jolie committed to acting professionally at the age of 16, but initially found it difficult to pass auditions, often being told that her demeanor was "too dark." She appeared in five of her brother's student films, made while he attended the USC School of Cinema-Television, as well as in several music videos. She began to learn from her father, as she noticed his method of observing people to become like them. Angelina Jolie Facts for Kids. Kiddle Encyclopedia.